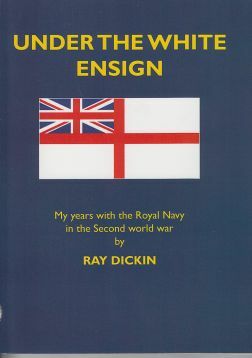 Under the White Ensign by Ray Dickin. When four British midshipmen were delayed in their sea journey to South Africa, General Botha Cadet Ray Dickin and three of his shipmates were drafted, at break neck speed (“navy style”), as replacements to HMS Dorsetshire in Simon’s Town. This is the amazing story of Ray’s adventures while serving in the wartime Royal Navy, worthwhile and lively reading to the end. Even more remarkable in that Ray was able to dictate his memoirs to tape between the ages of 80 and 83. There are two underlying themes. First, the tale is set against the all pervading backdrop of the Second World War. While on board HMS Dorsetshire although Ray came close to action in the South Atlantic, it was later when serving in destroyers and corvettes that he experienced action at sea in the Aegean and Mediterranean both during minesweeping operations and whilst escorting supply convoys for the Allies’ during their North African campaign. Attacked and sunk? Yes, but I will not pre-empt Ray’s story. 19 years old at the time, the horrors of war were grim, the sinking of one’s ship horrendous, but in the more relaxed times at home port base waiting for action, or with a few days leave, life could also be good! And this is where the second, and for me strongest, underlying theme of this book comes through: We share in these eventful times, as seen through the eyes of a 17/19 year old midshipman, later sub-lieutenant, then lieutenant in his early twenties. The excitement of going ashore in foreign ports, the wonderful hospitality given to the boys in blue by the ‘expat’ families, the girls, the parties. They lived life to the full! But as Ray concludes, these were the remarkable and often painful contradictions of war.